Page speed is now considered as an important signal that determines the position of a blog post or website in Google search engine. Keeping this in mind, we have developed the fastest* WordPress theme called WPsimpy. This theme is simple, clean and most suited for blogs using in-text advertisements. It can generate high CTR from Adsense when used in correct color combination. WPsimpy WordPress theme uses 100% valid XHTML and CSS code and it is SEO friendly. Highest Adsense CTR-when used with Blue color text ads. SEO friendly: Correct implementation of H1 tag, keyword density, speed and clean code. Great support: Ask your questions and customization requests in the comment section. You got my attention by saying its the fastest WP theme. I’ve struggled tremendously with my theme and as I am a bit fanatic about this, I can’t stand my site right now! I’ve read so many tutorials about improving the site and how necessary it is but actually, finding a good, fast, responsive, seo-friendly theme is not that easy. The best resource right now that I have found, is this site: https://ttfbtest.com/ – they have literally thousands of themes. Right now, what speaks for them is that they have speed tests backing up the themes legitimate speed. Have you done any speed test – like Pingdom or Google PageSpeed? Or is anyone using the themes and can say the speed? I’d like to give it a try! hello guys, just wondering, whose own this theme? smartin.in or downhub.com ? really confusing. thanks very much, this template is clear, and the simple, i LIKE IT.. I was impressed by the look of WPSimpy on this site. However, when I installed it on my blog, many of the features I see here on this blog are not present. Would it be possible to get a copy of WPSimpy that’s exactly like the one that’s on this site? you may turn the left sidebar into two smaller, both on the left? this is free? good i like this theme.. When is the new version of your theme coming out? We can’t wait! Hey, I love your theme but I can’t use it because the menu bar only shows ‘home’ and ‘uncategorized’ , while the actual pages are showing in the top right corner..
like this http://img839.imageshack.us/img839/7518/wpsimpy.png .. maybe i’ve overseen something. On another note, why doesn’t your theme show in the wordpress themes when I look for them via the admin panel? Any update on when the new version of WPSimpy will be out? We’re very excited for it! sir, great to see that you are also making themes for users like us .. thanks for that .. but in your other website you were using some code,such that if you click any image inside the post the image open in new page and the image inside the post is displayed below … can you please help .. but now the theme does not contain that feature.. please dont reject this post ..
all the best .. thanks in advance sir ..
fantasist theme. i like it. thanks for this theme. Just installed wpsimpy. Its awesome. Hi For above problem i solve with one Plugin Now problem is In my Home page sider bar RIght side is 300 size gape.If i put any widget its come down That space are empty not cover ads also.How can i solve this plz replay soon. dear admin i like your theme. i want to use it for my web site. i want support guide regrading different installation and layout issues. please suggest me some helping material. I am Waiting for your support. plzz help me regarding the issue. You can do that from post editor itself. Just upload one image and then do what I have explained in the above comment. Hey that’s simple :D After uploading image, choose position as left, and then re-size it to fix within the content at the top left section. I like your theme very much i want to use this for my web site but i am facing a problem that in main/index page no thumb of image is showing even when i am using image in the post. Please help me how can i solve it. I want to show image thumb on main page as your theme demo is showing. hi, i use wpsimpy on my blog. but why the footer is different if i compare with the demo? and in widget, i only find 1 sidebar available.. Thanks for the response. Any idea when we can expect the new version of the theme to be finished? When it’s ready could you post a comment to this thread so I get notified? Hello Sir, I think its an issue with the theme. I am making a new version of the WPSimpy theme with footer, author box, dashboard control and other features. You can check the preview of the new theme here- http://bit.ly/lP0paQ. For the time being, you may use http://wordpress.org/extend/plugins/wordpress-thread-comment/ plugin to solve this. Love the WP Simpy theme and am using it on a site contendingfortruth.com. When I have nested comments enabled, the replies don’t show up on the post page. It will say there are 4 comments but will only show 3 comments if one of them is a reply to another comment. Do you think this is theme related? how to change catagory bar color on wp simpy theme? I can want to set green color on catagory bar. Nice concept about word press theme. I like this theme. I think this theme is simple, clean and most suited for blogs using in-text advertisements. Thanks! Hi! Thank you. but I am still not able to get the logo image to appear even though I followed your instructions. I uploaded my image with my file manager on my cpanel. i named the ‘logo’ logo_1 and it is a jpg file too. but it does not appear. Do you think it has anything to do with my hosting blocking the image? When I first loaded your theme in my wordpress the ‘WPSimpy’ logo was not there either. Hello charlie, glad to know that you liked WPsimy WordPress theme. At this point you would need to change the logo label to something like logo_1.jpg and edit the same in WordPress files. Open theme editor from dashboard and edit header.php file. Find images/logo.jpg line and change logo.jpg to logo_1.jpg and save. Now upload logo_1.jpg to your images folder using FTP or cPanel file manager. I like this theme a lot! but i cannot get my logo to appear. I followed the directions that were given in a previous comment but it is still not working. I deleted the original logo.jpg and uploaded my logo.jpg but it does not appear. Also when I first installed the wpsimpy theme and viewed the site the original logo doesnt appear either. Please help. Can’t wait to start using this great theme. thanks for themes. i like your theme, but i wish to create your theme become 3 column. please advice for me, how to change your theme be 3 colume with left and right sidebar? can any one tell how to give automatic read more>>>. in all post in wordpress in this theme ? Hi, Thanks for the great and speedy theme. I was wondering is there any chance that WP Simpy 2.0 will be released soon? Can’t wait for that. Hope that all is well! I love the theme and am designing my blog, but I cannot get it to show up on the first page in magazine form (it just shows the posts in sequential order). How can I get the magazine layout on my home page? I could not find option for using static page as front page in settings->Reading tab in wordpress… Hoe can enable a static page in this theme and move my blog to a new page named blog. Please help. Like everybody here am I also impressed about your theme and I want to use it for some of my blogs. Right now I need to know how can I insert more px between widgets in sidebar and how can I use header in old fashion way, blog name and description, not logo picture. Thanks a lot. Good luck! Firstly..i’m very impressed with your theme..your theme is very amazing..fast load and clean design..
Where can i add google analytic code in WPsimpy theme? I want to know how to change background. Can it be changed? I want to use small picture as background. Please answer my question. Can you blogarize this template so that we can use it in blogger. if you make this template for blogger even in the future. just inform me through mail. The comment replies are not showing up. it works, but I needed to edit the comment-template.php file. Any suggestions on how to fix this other than hacking the php file? This is amazing wp theme and iam very thankful to you for providing this service. 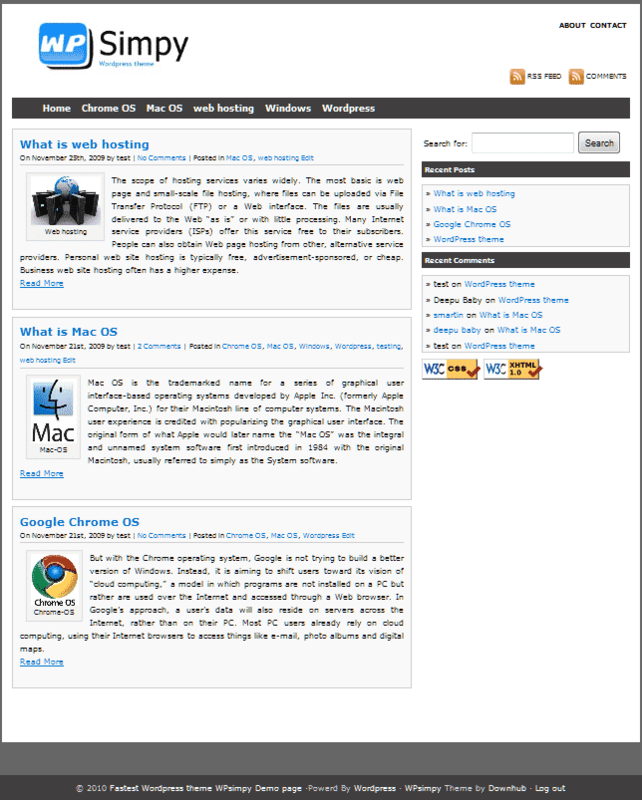 The theme is very well, nice, good, and clean with good seo. I will try soon and again i will come back. Thank you.Please let me know about my email. I have edited WPsimpy to suit your requirements. Please download the new theme here. I install WPsimpy and I found is beautiful. But I’m migrated from joomla and I’m not good with wordpress.Please can you explain me how can I remove the 3 social bookmark (facebook and 2 twitters) and the feed. Hey Jerome thanks, for your interest in WPsimpy WordPress theme. This is really a good theme. I am using this theme for my cars and bikes blog. This is a fast loading and SEO friendly theme. Now I am trying to add more plugins to my site with this Wp Simpy theme. This is really a good theme. I am using this theme for my auto blog. This is a fast loading and SEO friendly theme. Now I am trying to add more plugins to my site with this Wp Simpy theme. Very nice theme dude. Thanks for share it. hi brother, your themes in my blog very very.. fast, we ‘re like that. but my side bar … gone [miss]. please give me your solution. visit our testing [auto] blog. nice theme brother. I am currently looking for a clean n fast loading theme for my blog, and will certainly try WPsimpy. You can use the more tag in WordPress post editor to add read more in each article. To add Adsense under post title, go to Appearance> Editor> click on singlepost.php and find the code section that start with div class=”entry”. Now paste your Adsense code just above that section. Make sure that you use Adsense link ads. How to change the social media icons and corresponding links- in WPsimpy WordPress theme. Upload required logo images using WordPress media uploader. Now change all required links from the “topnavbarright” section. It is better to use h1 tag in the single post title to get more attention from search engines. However, I have fixed the h1 tag issue with the home page. Here is the most effective usage of h1, h2 tags in WordPress blogs. h1 tag for blog title and description. h2 tag for post title. P tag for blog title and description. I just want to review: Your themes is good just like genesis studiopress. Why you dont use H1 tag in frontpage n you dont use H2 tag in single post. Cant u fix it for SEO. Thanks. I will back again. Thanks for share it, i will test it. Upload the theme again with logo.jpg in the correct folder. I Just checked shelterfriend.com/wp-content/themes/WPsimpy/images/logo.jpg on Firefox. The image is showing 404 error. Otherwise open your cPanel, browse to file manager wp-content> themes>wpsimpy>images> and see if its available there or not. Keep the size of the logo file with in limits. Yes its fast, and use only valid XHTML/CSS code. You can use more tag in WordPress post editor to display summary at homepage. This theme is really fast… I moving to WordPress very soon. I tested this theme on localhost but I want the post to be displayed in summary at homepage. Can u help me out? How to change the default logo in WPsimpy WordPress theme. Extract Wpsimpy.zip file and change logo.jpg in the image folder with your logo. Remember to keep the name and extension the image as it is. Archive theme folder and upload it to the server. How to add Adsense link ads under navigation bar of WPsimpy WordPress theme. Move down and find out the div with id=”gadsense” and paste your link ads just beneath that.